Arterial insufficiency is any condition that slows or stops the flow of blood through your arteries. Arteries are blood vessels that carry blood from the heart to other places in your body. 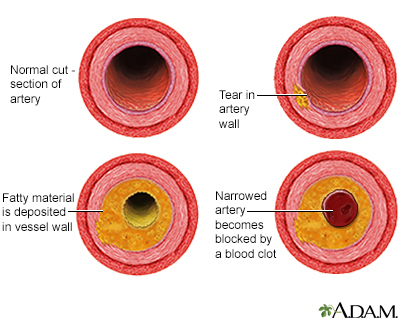 One of the most common causes of arterial insufficiency is atherosclerosis or "hardening of the arteries." Fatty material (called plaque) builds up on the walls of your arteries. This causes them to become narrow and stiff. As a result, it is hard for blood to flow through your arteries. Blood flow may be suddenly stopped due to a blood clot. Clots can form on the plaque or travel from another place in the heart or artery (also called embolus). If it affects your heart arteries, you may have chest pain or a heart attack. 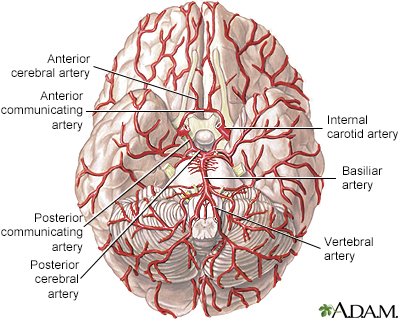 If it affects your brain arteries, you may have a stroke. If it affects the arteries that bring blood to your legs, you may have frequent leg cramping when you walk. If it affects the arteries in your belly area, you may have pain after you eat. Libby P. The vascular biology of atherosclerosis. In: Mann DL, Zipes DP, Libby P, Bonow RO, Braunwald E, eds. Braunwald's Heart Disease: A Textbook of Cardiovascular Medicine. 10th ed. Philadelphia, PA: Elsevier Saunders; 2015:chap 41.